Mars is the commander in nine planets. It is the owner of power, energy, self-confidence and courage. Its main element is fire and its main color is red. Copper is its metal and barley is its grain. Land and land products are affected by Mars. Aries and Scorpio is its sign. Mars is very strong in Capricorn sign and very weak in Cancer sign. A person’s nature becomes cruel and violent. It also reduces self-confidence and courage level. People face problems in property and land. At times, he might face blood disorders. Also, he might go in jail. If Mars is related with marriage then it will create problem in marital life. Nature: Offer red flower and water to lord Shiva every day. Seat on red bench and chant Shiva’s mantra i.e. 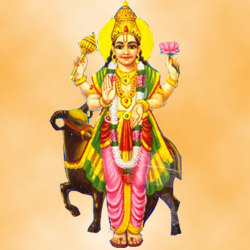 “Om Namo Bhagawatye Rudray”. One should do this measure for 15 days. Self-confidence: Wear red color clothes and seat in front of lord Shiva. Light a google incense stick. Chant “Shiva Tandav Strot”. It is more beneficial if you chant it with dance. You should do this measure regularly. Property: Go to lord Shiva temple on Tuesday morning. Mix jaggery in water and pour it on Shivaling. After that, worship lord Shiva to get benefit in property. It is quite beneficial to do this remedy for 9 Tuesdays. Health: Offer water to lord Shiva in copper urn. After that, chant “Om Hom Juhu Saha”. Leave little water in your urn and have it like dainty. It gives immediate results. Debt: Offer red flower to lord Shiva in every morning. After that, pour water on him. Chant “Om Runmukateshwaraye Namah Shivay”. You should worship him to get rid of debts. Remedy: Everyone should bow in front of his mother in the morning. It is helpful to get rid of Moon related problems.